Your product will soon be live on Kickstarter, this is when you’ll learn if all the testing and preparation has been worthwhile. All the time and energy you’ve put into the Kickstarter landing page, the Facebook ads, and the pre-launch email list. The failure to launch after all the hard work is something that happens to more campaigns then most would realize, after spending thousands of dollars and constructing the perfect email to send to your list telling them about the launch, and then only a few convert into sales. It happens to a lot of campaigns, most don’t understand why and question their product. Kickstarter represents less than 1% of sales compared to e-commerce. Ask yourself how many times have you made a purchase on Kickstarter? Most people don’t trust Crowdfunding in general, so no matter how good your product is you still won’t get the sale. Most project creators focus on building a list and think people sign up is going to generate sales, this is a huge mistake. We go through a deep process of qualifying people who sign up, making sure they will be able to purchase. To make sure your project has at least 200 sales day one we have bought in Medium Level Deposit ( MLD), this is vital for any project over $79 otherwise you could build a list of 10,000 and get conversions lower than 1%. Here you would tell potential supporters to place a Medium Level Deposit ( MLD) i.e if the product is $100 you’d ask for $20 as a deposit. What we have added to our 300 step funnel to success is a way to check audiences and make sure they convert. Create a landing page that informs them upfront of what the project is and provides not just a snapshot. Based on this example you might turn off the Rolex audience and Fitbit audiences as they are delivering costly sign-ups, but wait we need to assess the quality. So as you can see from the example above, Fitbit might be the most costly lead generation audience but it will lead to the most sales when you launch your Kickstarter. 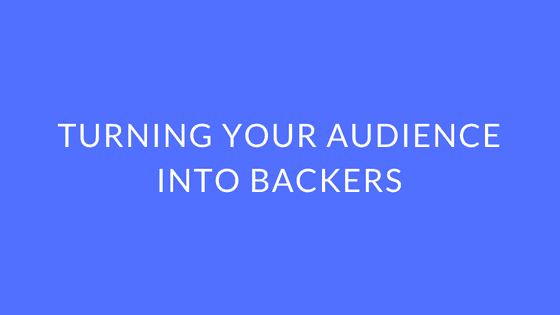 Kickstarter is an ever changing world, as more and more people use Facebook to build audience people are also becoming used to filling in email addresses but don’t end up buying. As marketers and project creators we have to constantly adjust our strategies.